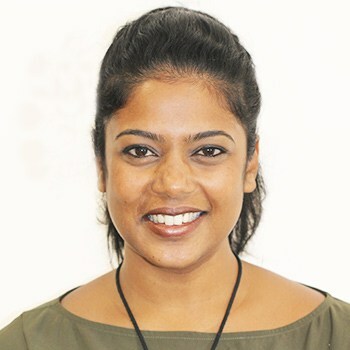 Victoria Park Dentist Dr Deepa (Dee) Thirukumar attended the University of Sydney, graduating in 2011 with her Bachelor of Dentistry (BDent). Loving the instant gratification she gets when seeing a patient who is immediately pleased with their new results, Dr Dee aims to provide the best in dentistry for her patients. Dr Dee is a current member of the ADA WA and aims to make a lasting impression on the oral health of the patients she’s honoured to work with each and every day. To ensure her patients always receive the care they deserve, Dr Dee stays up to date on the current trends and technological advancements in the field of dentistry, attending regular courses and lectures to further her own techniques. When she isn’t helping patients smile brilliantly in the practice, Dr. Dee enjoys spending her time exploring Perth after spending the past 23 years in Sydney. Dr. Dee also has a young daughter. As a family, they enjoy going on long walks and taking trips that allows them to discover everything that beautiful Western Australia has to offer. Get to know more about Dr. Dee and how she can help you achieve your goals in oral health by booking an appointment with us today!